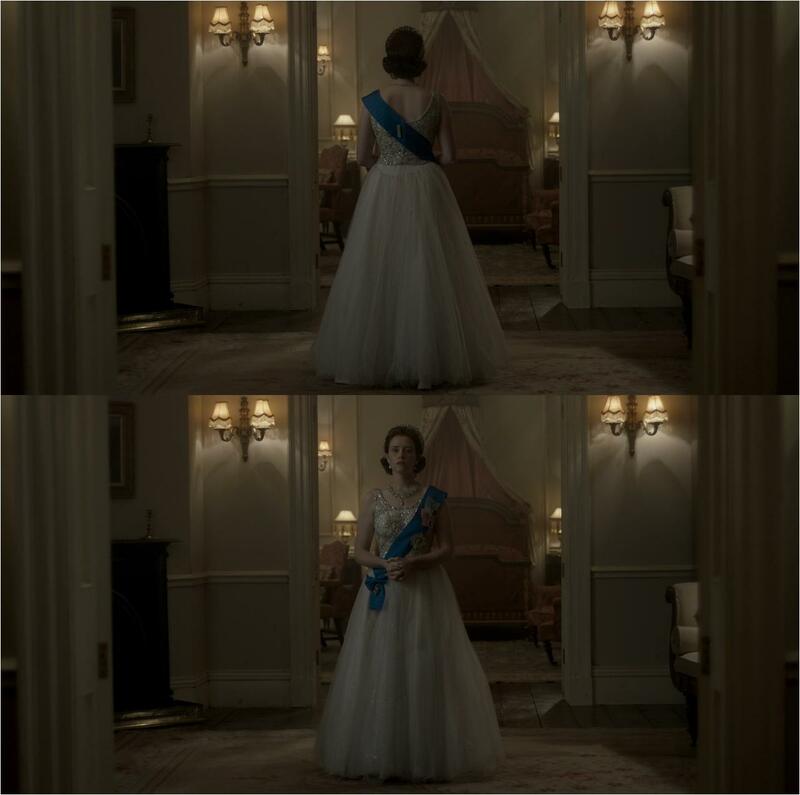 Netflix's The Crown intends to cover one decade of The Queen's reign per season, and season 2 is already in production. Until then, we'll wrap up our coverage of the famous jewel reproductions spotted in season 1 (see coverage of episodes 1-3 here and episodes 4-6 here). Episode 7: Just a little something for those who have wondered how the men keep their sashes when dressed in white tie. Buttons! This is true. Episode 8: And here we go again with Princess Margaret wearing things (the Cambridge Lover's Knot Tiara) she never wore. In this case, however, they’re actually doing it on purpose. Fictional Margaret is getting ready to host the Diplomatic Reception while The Queen is off on the coronation tour, and she decides to borrow a tiara without permission. (The "State Diadem" or the "Cambridge Lover's Knot Tiara", she suggests to her dresser.) This is about the rebellious personality they're trying to convey instead of accuracy. Not that that will stop me from noting that, should one have found one’s self in the mood for a little light jewel thievery at the time (ahem), one would have discovered that this tiara was with The Queen on her trip. 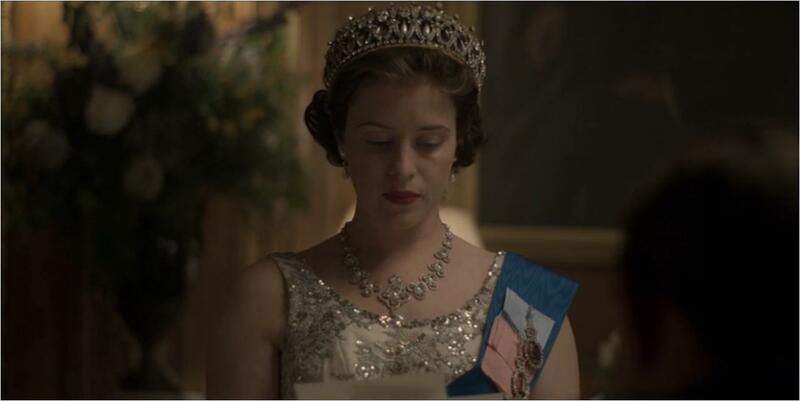 Understandably, they swapped the George VI Festoon Necklace (worn in real life) for Queen Victoria's Golden Jubilee Necklace, since they didn't remake a ton of jewels for this season. They did well by Clementine Churchill's jewels and orders, too. I believe she is wearing the Order of the British Empire, of which she was a Dame Grand Cross. 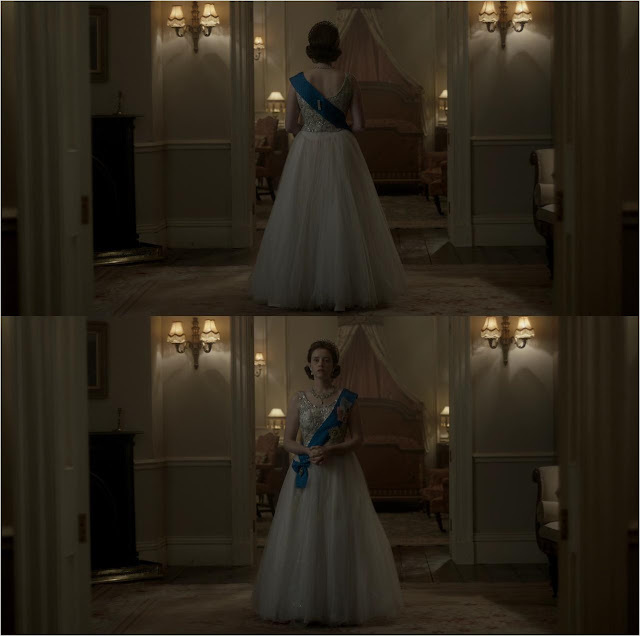 Episode 10: Twirling at Balmoral gives us our first and only glimpse of The Queen Mother in a tiara. The series' portrayal of Queen Elizabeth was a low point for me - at times it seemed she was only there for maneuvers against The Duke and Duchess of Windsor - but the combination of the Greville Tiara and Queen Alexandra's Wedding Necklace is spot on. Episode 10: The Lover's Knot Tiara played a surprisingly large role in this season. The Queen certainly wore it in these early years, but it was never one of her signature pieces. I suppose it is just one of the family's more famous tiaras overall, and it will certainly come in handy when they get to the Diana years. What I really can't believe is that we saw no sign of the Girls of Great Britain and Ireland Tiara, which would be my first priority when recreating Her Maj's diadems. Episode 10: The show sneaks in one final tiara with the George IV State Diadem. They appear to be recreating Baron's 1953 portraits of The Queen here, where she wore the City of London Fringe Necklace. Generic pieces are filling in for the rest of the look, the earrings apparently representing the Greville Chandelier Earrings that were worn for the real sitting. And that's a wrap! I may pick on the jewels - because, well, I just can't help it - but I thoroughly enjoyed the show overall. They say it's the most expensive television show ever made, and I believe it. It's extremely well done, and well worth your time.